Cool. I been a fan of the Archie TMNT Comics. and its great to see this story finally getting done. This is some of the best news I've received all year! Is there somewhere to crowdfund yet? Is there somewhere to crowdfund yet? No, there won't be any crowdfunding. Send Arseniy a message here or on Facebook or E-Mail. Woweewowow. Too good to be true!! Just sent an email! That's amazing Chris Allan is back at the helm for it. I had an inkling something might be in the works when I saw he was doing special covers for y'all... Out of curiosity, how involved is Murphy in this conclusion? Out of curiosity, how involved is Murphy in this conclusion? Thats what I was wondering. If Murphy already had the script finished then I would imagine he is not really involved at all. I am just wondering if this is "His" actual storyline and ending or if some of the plot detail had to be filled in by others. The script for the first two issues was intact within the pages. The synopsis/plot for 3-5 was mapped out by Arseniy, Artyom Tsarkov, and Egor Prutov a while back. Having read them, of course, I think the first two (intact) issues provided a pretty good roadmap of where things were supposed to go from there (also bolstered by knowing what's on the covers), if not perfectly. I'm writing the script for 3-5 based on that synopsis/plot. This is some exciting news! So am I understanding this correctly? 1 and 2 were already written as an actual continuation by the original publisher and 3-5 are sanctioned fan-fiction? 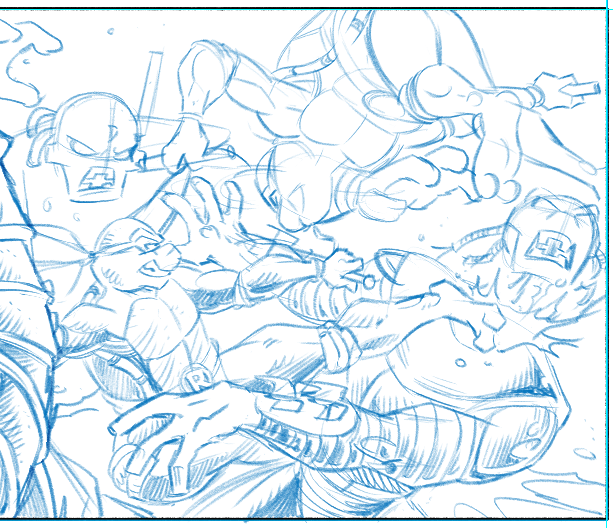 Here is a little sneak peek from a totally new page from Chris Allan. I'm going to show you some old and new stuff from time to time, stay tuned! Haha, I thought of that too. Granted, I'm not sure I want to see how that wraps up.